One cold April day in the spring of 1974, a new writer was presented to the editor of The New Yorker magazine, William Shawn. The New Yorker was essential reading for the New York arts crowd in those days; it published the best of literary journalism, and “Mr Shawn” was its king. The editor and the writer were introduced over lunch at the Algonquin Hotel. He was middle-aged, white, and a pillar of the New York establishment. 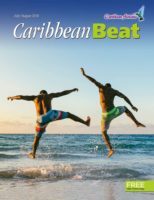 She was young (not quite 25), tall, skinny, and black, from the Caribbean. She wore a pink and white silk dress with a brown jacket (“the one I usually wore with jodhpurs”). She had recently changed her name to Jamaica Kincaid, to give herself a new identity. She nervously ordered the most expensive dish on the menu. Mr Shawn ate a slice of cake and sipped some tea. He wasn’t sure she was quite suitable. Still, he let her try a short piece for the magazine’s “Talk of the Town” section. 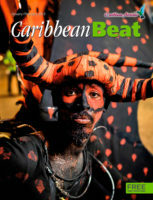 She wrote about the West Indian carnival in Brooklyn; Shawn published it that September. Had Shawn known what changes this young Antiguan was going to make in his life, he might have ordered something stronger than tea. 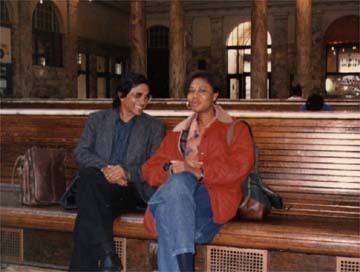 For, in the next few years, Jamaica Kincaid would marry his son, convert to Judaism (the family faith), settle in Vermont, and give him two half-Caribbean grandchildren. She would become a famous writer, and a star contributor to The New Yorker for 20 years. She would teach literature and creative writing at Harvard. And such chemistry would develop between them that she would publicly praise him as “the perfect reader” and the perfect editor (“he always made you feel you were the best writer of all”). She would write enough “Talk of the Town” stories (another 84) to make a book, which she would dedicate to her New Yorker colleagues and to “William Shawn, whom I think about each day with love and whom I shall never, ever forget”. Elaine Potter Richardson (as she originally was) had been sent to New York from Antigua eight years before she met Shawn. Her stepfather’s failing health and the arrival of three baby brothers had drained the family finances. Elaine, a precociously bright child and a voracious reader, had been taken out of school and sent away to earn some money. When she arrived in New York, around the time she turned 17, she worked with a well-to-do family in Westchester as a nanny or au pair (a “servant”, she says). She moved on after a year to another family in Manhattan (she was “incredibly depressed and lonely” in these jobs). She started college but dropped out, studied photography but didn’t pursue it, and took a string of low-paid jobs to survive. She was a secretary with a photo agency, a receptionist with an ad agency; she modelled and sang; and she started submitting freelance articles to magazines. Ingenue published her first piece, an interview with the feminist campaigner Gloria Steinem. Elaine reinvented herself in New York. She cut her hair short and bleached it blond, flaunted cast-off clothes and vivid red lipstick, shaved her eyebrows and replaced them with gold streaks. She claims to have gone to a Halloween party as Josephine Baker, dressed only in a string of bananas around her waist. A chance meeting in an elevator led to an introduction to a New Yorker writer and thence to the legendary Mr Shawn. For Kincaid (as she was now), writing was already her top priority, the thing that would make sense of her life. And Shawn gave her the sort of apprenticeship that most writers only dream of. She had a free hand, a regular outlet in one of the world’s most respected titles, and a large, literate audience. She had a great editor whispering encouragement and guidance over her shoulder and validating her as a writer, precisely the thing she most needed. She had the perfect passport to New York, too, going out to social events, launches, openings, new entertainment spots, press briefings, celebrity interviews. Her “Talk of the Town” stories were adventurous, amused, ironic, funny, with a sharp eye for the odd and the absurd. She tried out new formats; in one piece she ignored the event she was supposed to cover, and simply listed the expenses incurred in staging and reporting it, including the cost of the building. Kincaid also used The New Yorker to try out the fiction she longed to write. Most of the material in her early books appeared first in the magazine. In her “Talk” pieces, she had discovered that invention can be just as truthful as fact. She had invented dialogue, invented characters, rearranged events, introduced herself as a third-person character. In her fiction, where she wrote at last about her own life, she remoulded real events and characters into stories, and published them in the magazine before collecting them into books. 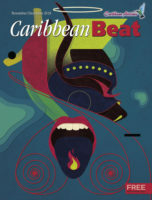 From the very first page of Kincaid’s first book it was clear that this was a powerful new voice in Caribbean fiction. In one long sentence, filling nearly three pages, Kincaid’s first story (“Girl”, written one Sunday afternoon) strips bare a girl’s relationship with her mother. Kincaid has described her family as “poor, ordinary people . . . banana and citrus-fruit farmers, fishermen, carpenters, and obeah women”. Her mother, Annie Richardson Drew, was from Dominica, the daughter of a Carib woman and a half-Scots, half-African policeman. Her biological father, Roderick Potter, was an Antiguan taxi driver whom Kincaid hardly knew. David Drew, her stepfather, was a carpenter, much older than Annie. The family was Methodist. Her mother taught her to read, and she devoured the English classics — Shakespeare and Milton, the King James Bible, Jane Austen, the Brontë sisters. After this, Kincaid reverted to a more conventional style. 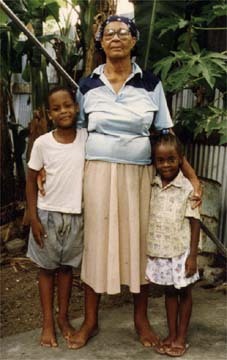 Annie John is about a young girl growing up in Antigua and eventually being sent away to study. 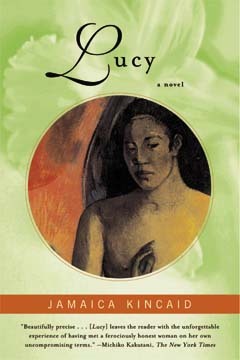 Lucy is about an Antiguan girl who works as a nanny for a New York family, but leaves them after a year to break free and find her feet in the city. The Autobiography of My Mother is about a girl growing up in Dominica and eventually leaving for Antigua, as Kincaid’s mother did. Mr Potter is about Kincaid’s biological father. All these books deal, in different ways, with rejection, loss of love, and the assertion of independence and identity. Some key images and events turn up more than once, dressed in different clothes. Kincaid’s non-fiction books elaborate the ideas underlying her fiction. A Small Place records her angry response to her homeland when she returned there in 1986 for the first time in 20 years. My Brother documents the way she responded to the illness and death (from AIDS) of her youngest brother David. These books use the same “voice” as the novels, the same stately biblical rhythms, the same meticulous precision, and the same anger and irony and humour (hardly any critic has noted how sharply funny Kincaid can be). 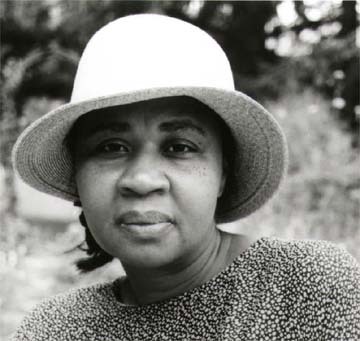 Scholars have been strongly drawn towards Jamaica Kincaid. Her work presses all the right buttons in the academic psyche (“postcolonial”, “black”, “gender”, “feminist”, “transcultural”, “postmodern”). But for general readers, her greatest attraction lies in the sheer beauty, the power and intensity, of her writing. She doesn’t use much dialogue (“I’m not able to do it”), and the narrative voice hardly changes (“that has its limitations, no doubt”). Her books are short (“I wish I could write longer, but I can’t”) — which is just as well, since hers are not the sort of books you skim. But every sentence seems to be patiently hewn out of rock; you feel that the thing being said has never been said quite so clearly and beautifully before. Just as important is what Kincaid has to say, particularly the things she is angry about. And there are plenty of things she is angry about. The biggest of them is her mother, and the ruin that can ensue from loss of love. 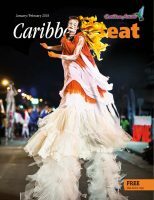 The weak or absentee father, the strong, overbearing mother — these are figures familiar to everyone in the Caribbean. During her childhood, the young Elaine (not yet Jamaica Kincaid) was extremely close to her tall, beautiful mother, despite Annie Drew’s powerful personality and determination to mould her daughter into a proper, respectable middle-class lady. Her biological father was absent, there were no other children, so mother and daughter were thrown together into a sort of “love affair”. But then Annie married David Drew, and three young brothers appeared in quick succession just as Elaine was entering her adolescence and asserting her own selfhood. The relationship changed drastically. Elaine felt that her mother’s love had been withdrawn, that she had been inexplicably rejected and cast out. There were horrendous rows — once, after Elaine forgot to change a baby brother’s diaper because she was busy reading, her mother gathered all her treasured books together and burned them in the yard. Kincaid has repeatedly said that her mother should never have had children. Years later, in the US, the tempestuous love-hate relationship continued — after a stormy visit by her mother to Vermont in 1990, Kincaid, no weakling herself when it comes to confrontation, resorted to therapy. This painful separation — the need for maternal love, anger at the loss of it — is the core of Kincaid’s books, reworked obsessively from one to the next. “Before this young-lady business,” muses Annie John, “I could sit and think of my mother . . . and always her face bore a smile for me. Now I often saw her with the coolness of her mouth turned down in disapproval of me.” Lucy’s mother tells her she was named after Lucifer, the devil, a “botheration” from the start. So Annie John, like her creator, hardens her soul, turns her back on her roots and accepts a new life overseas, “where nobody knew a thing about me and liked me for just that reason . . . [for] the whole world into which I was born had become an unbearable burden . . . I have vowed never to be fooled again”. That hardness, that resolve never to be fooled by the world, shows up in all of Kincaid’s writing and in some of her interviews. But it is not just a matter of the volatile Annie Drew. In Kincaid’s books, the loss of maternal love suggests other sorts of exclusion and humiliation. Young Elaine had received a standard colonial education with all its absurdities — waving the Union Jack, saluting the British Empire, singing Rule Britannia, cheering a visiting “putty-faced princess” (Princess Margaret) on a royal visit. England was the centre of the universe. But Elaine was bright enough to see that behind all the imperial symbolism, behind even the street names and business names of her home town, lay the brutal reality of enslavement and colonisation, and that the old relationship between the powerful and the powerless had barely changed. Nelson and Rodney were not naval heroes but “maritime criminals”. “History” (thinks Xuela Desvarieux in The Autobiography of My Mother) is just the story “of people I would never meet — Romans, Gauls, Saxons, Britons, the British people”: it had behind it “a malicious intent: to make me feel humiliated, humbled, small.” People “who looked like me” had even come to believe in the gods of the people who had conquered them. For Kincaid, “loss” reaches out from the home to the experience of enslavement, of colonisation, and of being excluded from any hope of equality with the coloniser. One feels erased as a person, accepting impotence and clienthood long after the colonisers have gone home. Hence the anger, finely controlled yet passionate, that seeps through almost every page of Kincaid’s writing. No kindness can assuage the furious defiance that flows from this sense of wrong. Lucy notes that her well-meaning white American employer “smells pleasant”, but “By then I already knew I wanted to have a powerful odour and would not care if it gave offence.” This is how Kincaid’s young protagonists feel, and not just about deodorants either. This is not unfocused (or even personal) anger. 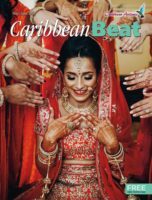 It is a need to redress the whole skewed narrative of colonial history, to rewrite the story from the point of view of the vanquished, for whom the world is a very different place. Kincaid has no interest in being a “black writer” or a “feminist writer”: her concern is to work through the anger, the loss, and the depersonalisation, in order to become one’s own person, to repossess oneself. 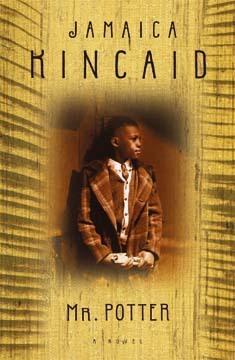 It is not hard to see why Kincaid adopted a new name as she developed a new identity in America. Her books brood on naming, the empowerment that comes from bestowing a name. “I . . . feel myself grow solid and complete, my name filling up my mouth”, ends At the Bottom of the River. Without that power, without the power of being literate and articulate, one remains a blank, unaware of the rest of the world, without a context for what happens in life. This is the condition of the protagonist in Mr Potter. There is a photograph of Jamaica Kincaid by Annie Liebowitz which appears on the back cover of some of her books. She is leaning back in a garden chair with a suggestion of leaves and branches behind her, wearing a wide-brimmed gardening hat and a loose shirt, arms behind her head, and a grin on her face. She looks content, almost mischievous, even a little defiant. She looks ready to take on anyone who might challenge her right to be content or to speak her mind. She also looks like someone who has just planted out a good row of seeds. 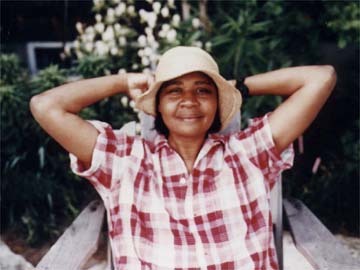 By the time she left The New Yorker in 1996, Jamaica Kincaid had become an experienced gardener. Some years earlier, her husband had given her a Mother’s Day gift of “a hoe, a rake, a spade, a fork, some flower seeds”. She immediately dug up “a large part of the small yard . . . and put all the seeds in the packets into the ground. And that was that, for nothing grew . . .”. But she acquired expertise. She became a compulsive reader of plant and seed catalogues, and even spent a month in China collecting seeds and hunting for plants. 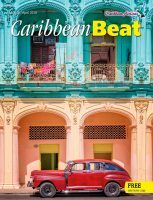 Some years and two houses later, she realised that her eccentric garden layout was actually a map of the Caribbean and its sea, “an exercise in memory, a way . . . of getting to a past that is my own . . .”. All things are connected; and Kincaid’s garden became a source of much meditation. 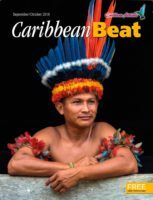 It made her think of the brutal conquest of Mexico by Spanish conquistadors, how the old Mexicans had grown flowers for the beauty of them, a civilised thing to do, and how in the Caribbean this pleasure in planting had been brutally replaced by forced labour. It showed her the parallels between gardening and colonisation, both of which impose foreign order and beauty upon a natural environment. 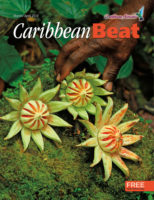 She read of botanists who forcibly transported seeds and plants to foreign soil like slaves to the Caribbean, and gave them new names and identities that erased their past. Her garden also reminded her that all pleasure and privilege depends on the toil and suffering of somebody else. That most nations with serious “gardening cultures” also had (or have) empires — surely no coincidence? None of this put her off tending her own garden (the author of one study of Kincaid’s work thanks her for “taking perfectly good gardening time to talk to me”). Nor did it fail to link up with her other work. She edited a book in which enthusiasts identify their favourite plants; wrote a gardening column for The New Yorker, and collected some of the pieces into My Garden (book):. Even in a garden in Vermont, the conquistadors are never far away. But all around them, new things are growing. 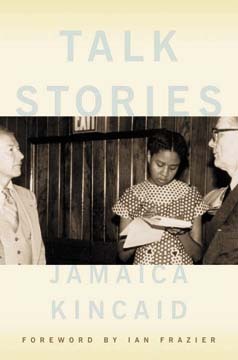 All quotations are from Jamaica Kincaid’s books or published interviews. Jamaica Kincaid’s new book, My Favourite Tool, is listed for publication in 2005.